The territory of the Haut-Richelieu crossed bike paths can admire the wonderful landscapes of the region. 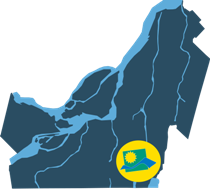 The developed network provides access to unique locations and connects with the surrounding regions of the Eastern Townships, Montérégie and Eastern and Western United States. For a change from a day visit or more comprehensive cycling networks Haut-Richelieu mess up your hair. You can access a map of the network of bicycle paths on the website of the Route verte .